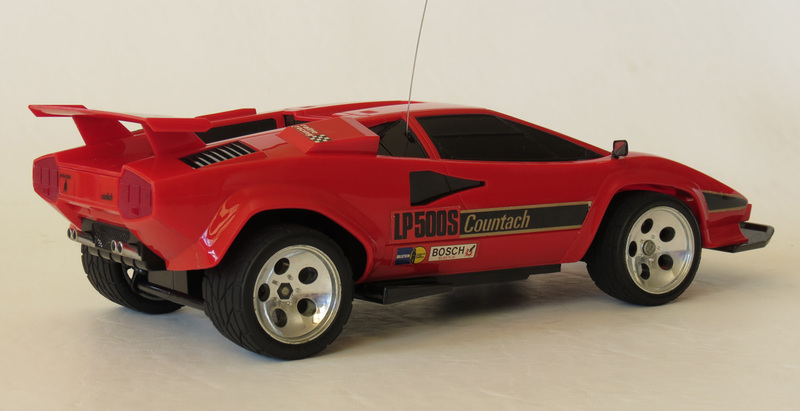 With a blazing top speed of 31km/h, Taiyo’s twin-motor Lamborghini Countach LP500S of 1987 wasn’t the first R/C model of this iconic supercar. But it was certainly one of the best looking. 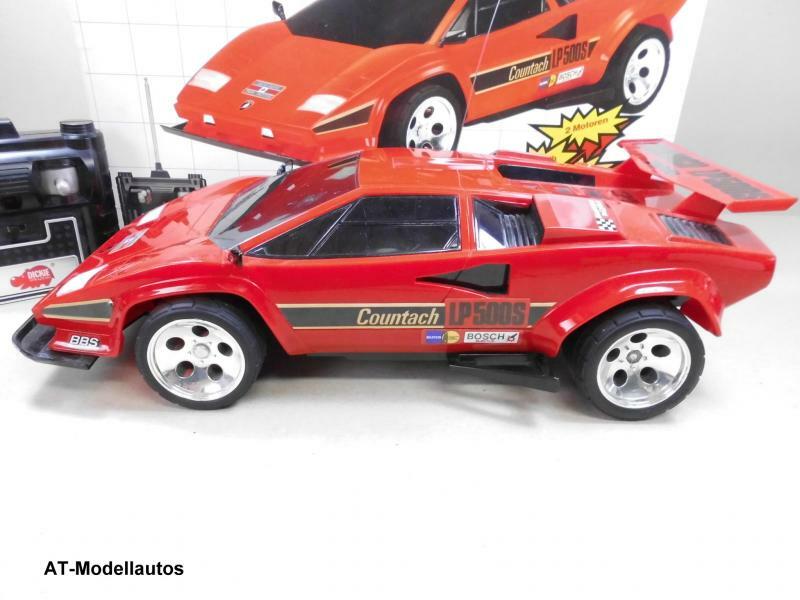 Blessed with proportions that seemed to do justice to the wild and angular full-sized vehicle, and with performance to match, this was a ready-to-run R/C car from the late 1980s that was capable of surprising the kid next door with his Tamiya. Think back to the road legal “supercars” of the 1980s, and there were a handful of vehicles that were so famous during those years that posters of them must have adorned a million bedroom and garage walls around the world. And I’d argue that there was no sports car more famous or more desirable, than the great Countach by Lamborghini. First appearing in the early 1970s and initially entering production as a 4 litre vehicle, this Bertone-designed vehicle was later updated with 5 litre engines and some additional body flare – such as the famous rear spoiler. It’s futuristic design was unlike anything the world had seen, but by the early 1980s it had become an icon – synonymous with the times. It was every bit as powerful as it looked, with a top speed of over 300km/h. And one might even say it reflected some of the wealth, power and indulgence of western society in the 1980s. Mk2 – Differences: Slick tyres on car and box picture. Model number 8758-27. Possibly Europe only. By way of example, anyone old enough to remember the 1981 movie The Cannonball Run may recall that this comedy film (about a crazy illegal car race across the USA) opens with a famous scene of a rather fetching black LP500S screaming across the American midwest with a police Firebird in hot pursuit. A couple of years later, the sequel opened in much the same way. Inevitably, such a machine was the dream of many a small child, and for most people would forever remain a dream. But, as a car magazine I used to read would often say about exotic cars, “Be thankful that it exists.”. Such motoring unobtainium was perfect fodder for toy companies of course, who went on to miniaturize cars like the Countach in such numbers that it must surely be one of the most widely produced toy vehicles in history. 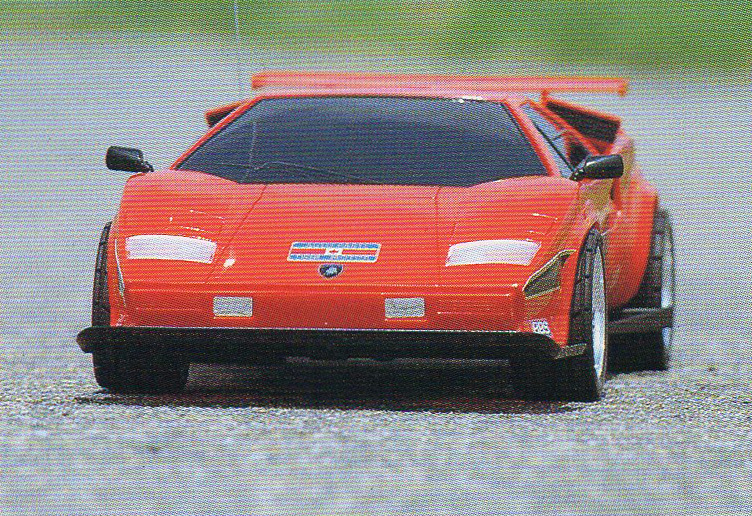 Among Transformers toys alone, 2 out of the 11 full-sized generation 1 Transformers cars released in 1984, were based on the Lamborghini Countach (i.e. ‘Sunstreaker’ and ‘Sideswipe’). And naturally, there were dozens and dozens of R/C cars also hoping to capitalize on the appeal of the vehicle, including some early hobby grade kits from both Tamiya and Kyosho. 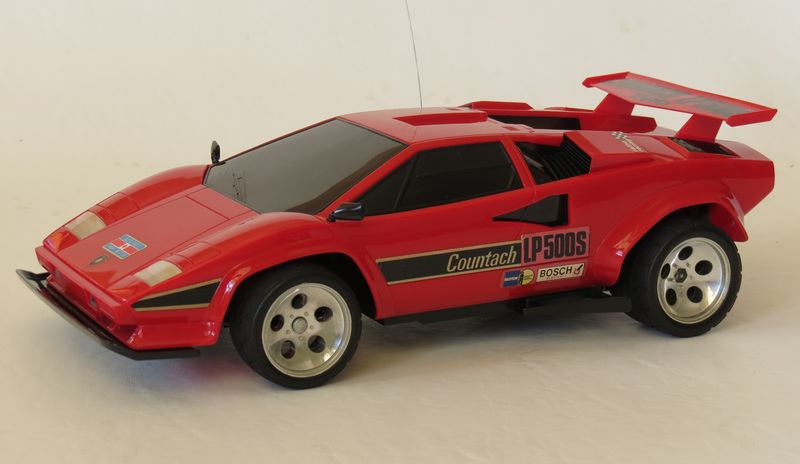 But while I love the Lamborghini Countach, of all the toys modeled after it there’s one R/C example that catches my eye more than any other. 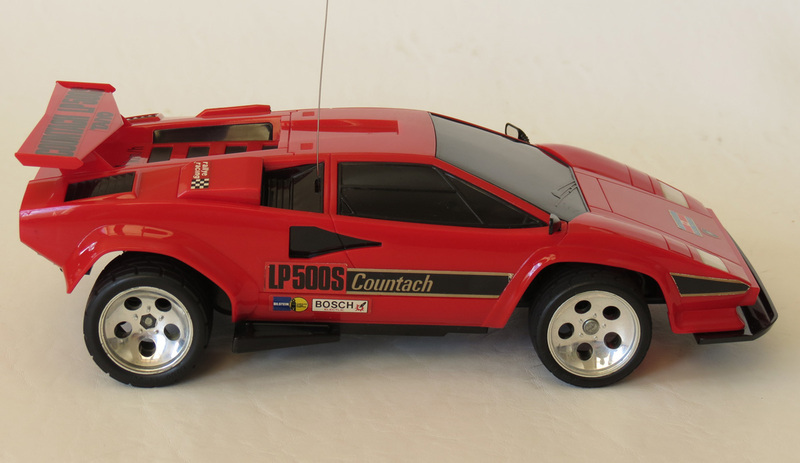 And that’s the Taiyo Lamborghini Countach LP500S. 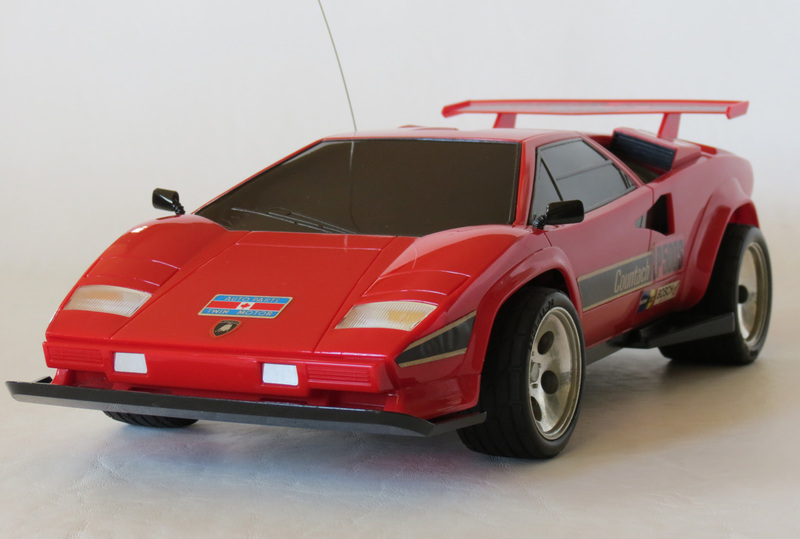 Released in 1987, this 1/12 scale vehicle was Taiyo’s first fully functional R/C Lamborghini Countach, and was model number “8758”. They also made another Lamborghini Countach the same year, but it was smaller and not as fast – certainly not capable of 31km/h anyway. As a kid in the 80s, one of the first things you generally wondered when seeing a toy like this for the first time was “How fast can it go?”. 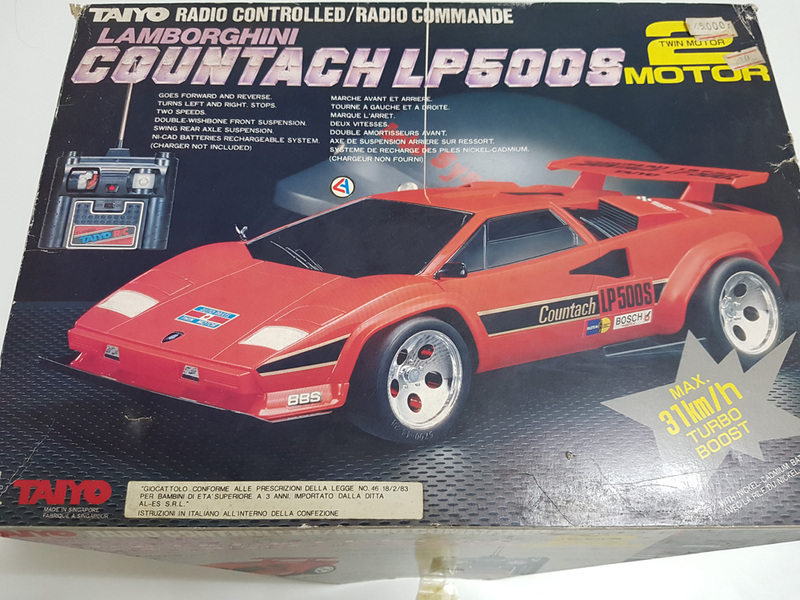 And I always had the impression that Taiyo understood this better than any other brand on the market in the 1980s, as just about every R/C car they released after 1986 had it’s top speed clearly advertised on the packaging and paperwork. In this case, the top speed is even proudly displayed on the car itself, with a large decal beneath the rear spoiler. As you can see when comparing this toy to the earlier image of the real car, Taiyo pretty much nailed this one from the wheels to the wipers. This is a typically well-made Japanese R/C toy from Taiyo, and is as durable to drive as it is beautiful to behold. For a ready-to-run R/C vehicle of the era, they really went to some effort to keep this model authentic to the real, road-going vehicle, while adding just a little sponsorship and branding for a bit more of a racing flavour. The example featured here is of course an original release of this model – as sold in Japan, Europe and elsewhere. This original release was only available in red. 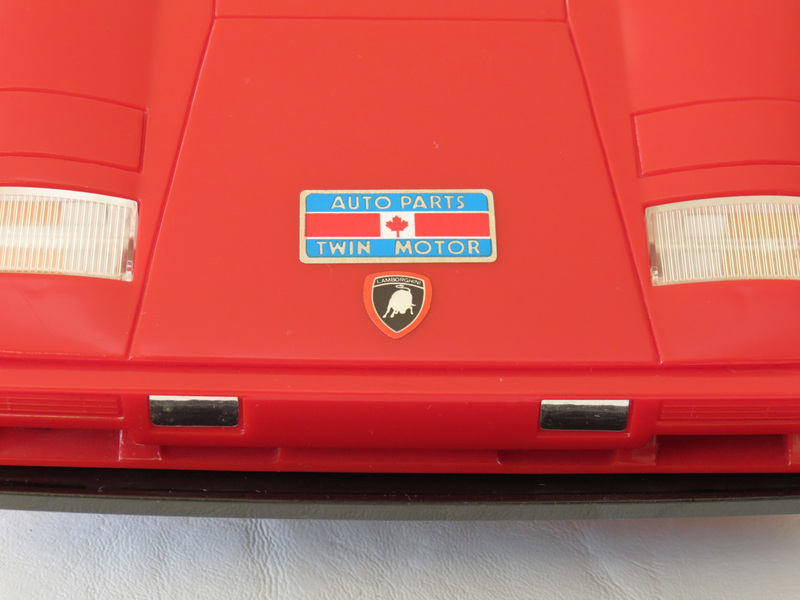 In the USA, the model was altered a little and marketed through Tyco as the “Tyco/Taiyo 9.6v Twin Turbo Lamborghini Countach”, which further hyped the twin motor aspect. The American release was also offered in two colours – red or black. So why exactly does this model seem like a particularly good representation of this classic Lamborghini supercar? A few years ago, I read the excellent book Master Modeler: Creating the Tamiya Style written by then president (now chairman) of Tamiya Corporation, Shunsaku Tamiya. The book has absolutely nothing to do with Taiyo products of course. But in one particular chapter, Shunsaku talked about the challenge of creating an accurate toy or model from any real world vehicle, and how it often involved taking a certain artistic liberty with the dimensions of the object in question. To put it simply: if you create a scale model by measuring the dimensions of a real vehicle, and then reducing those dimensions down by precisely the same proportion, something strange often happens – the resulting model often doesn’t look quite right. Perfect proportions don’t always translate into perfect toys it seems, and a certain artistic nuance is needed to make a miniature convey the same impression as an original. 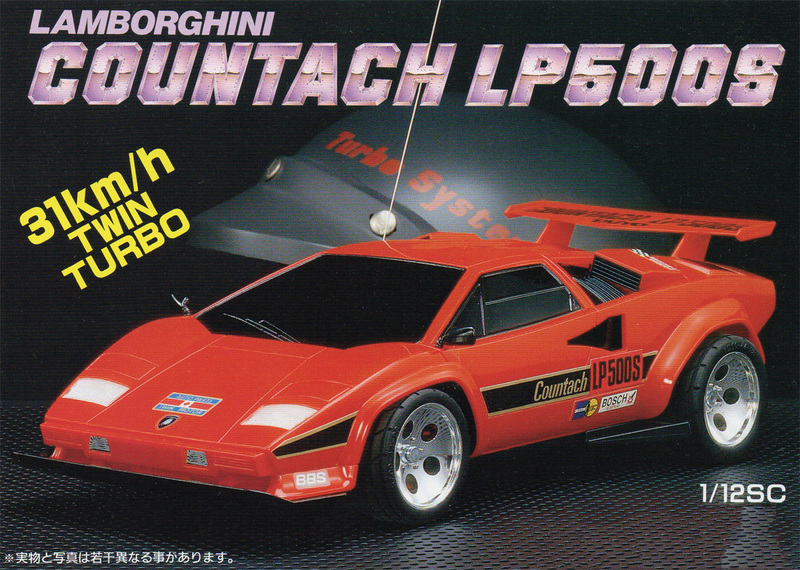 Now, I have no specific proof that this is the approach Taiyo took creating their Lamborghini Countach LP500S. But I do get the feeling that it’s dimensions aren’t a perfect reduction of the real vehicle. 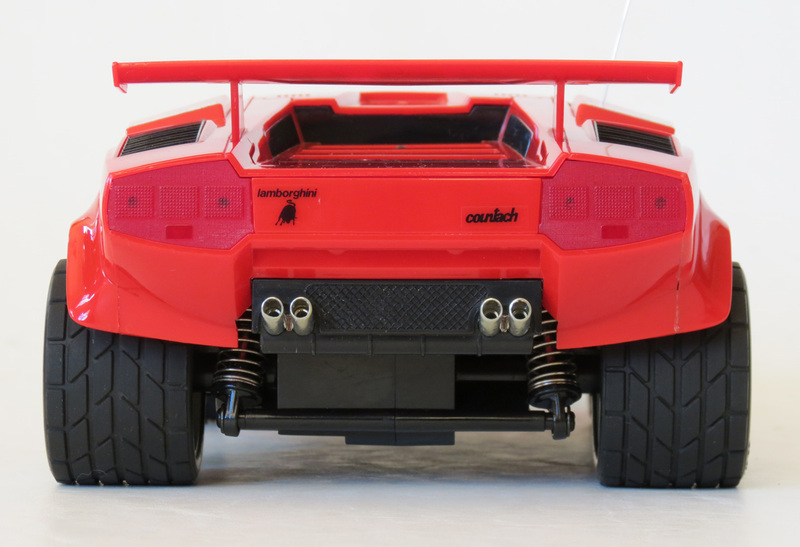 Yet the toy itself seems to ooze the power and spirit of the monstrous original, in a better way than most other toy Lamborghini Countach models I’ve ever seen. 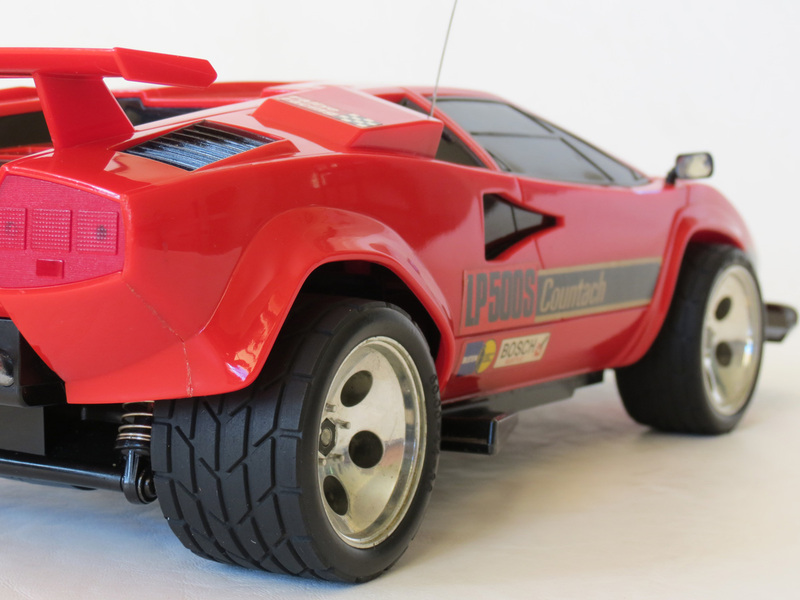 If anything, the Taiyo Lamborghini Countach LP500S is an abstraction of the real vehicle, with taller ground clearance (necessary for a toy), wider wheels, and generally exaggerated dimensions. 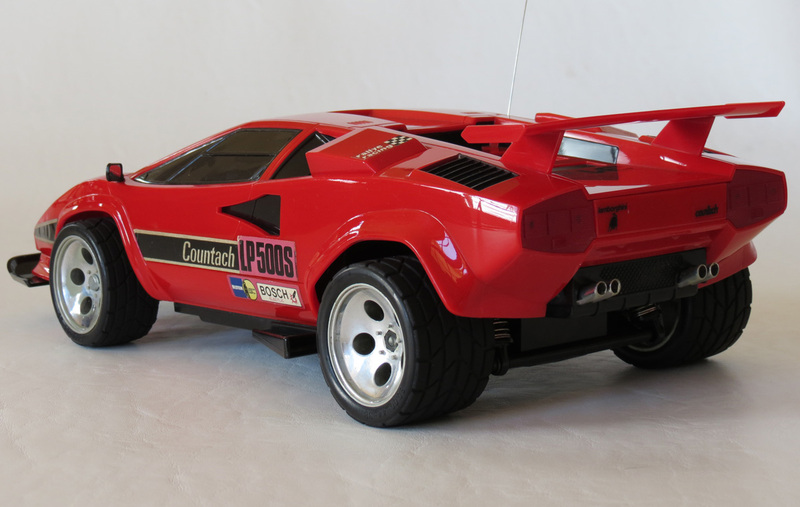 Yet it’s aggressive stance and ratio of length vs width actually seems more befitting of the original than even those R/C Countach’s that Tamiya released in the late 1970s. Underneath it all, and unlike most of the R/C Lamborghinis before it, this is a model designed to offer some reasonable driving versatility for an “on road” car. As mentioned earlier, the ground clearance is taller than that usually found on smooth-surface R/C cars, meaning it could easily traverse small pebbles on your average bitumen road or driveway without completely ruining the undercarriage. The chassis actually carries spring suspension at all four wheels, and these are visible and almost “buggy like” when seen from the rear. The suspension layout is independent at the front, with a rolling rigid rear-axle at the back. And then of course, there is the much vaunted “twin motor” system. Thinking back to 1987, this model must have been on the cusp of being the very first to offer the twin-motor idea. Nikko was exploring it with the Nikko Stealth (aka Dictator) buggy at around the same point, and the Tamiya Clodbuster (a huge and heavy monster truck released in 1987) had also employed it (somewhat out of necessity). But from about 1987 onward, Taiyo embraced the idea of twin-motor systems as few other brands had, and went on to release perhaps a dozen different cars that used it, including the Fast Traxx. All of them had the distinction of being among the fastest models in Taiyo’s line-up, although the 31km/h stop speed shared by several models appears to have been the peak speed of any Taiyo model. The two motors included in this instance were Mabuchi RS-280 motors. And for a vehicle designed for mostly smooth surfaces, this meant it could indeed wind itself up to a top speed north of the 30km/h mark, placing it in the league of quite a few kit models of the 80s. Taiyo’s own history documents even suggest this 31km/h was something of a milestone for the small toy company, calling it “The challenge to the speed limit! RC car is compelling to sprint at 31km/h.“. And it was clear that their goal was (as it always was) to try to bother the more expensive hobby brands by offering an attractive and compelling vehicle that anyone could unbox and play with, without any assembly required. The leaf is actually a symbol of the involvement of Canadian businessman Walter Wolf, an oil magnate turned Formula One team owner who also took an interest in Lamborghini during some difficult years for the company in the late 70s and early 80s. 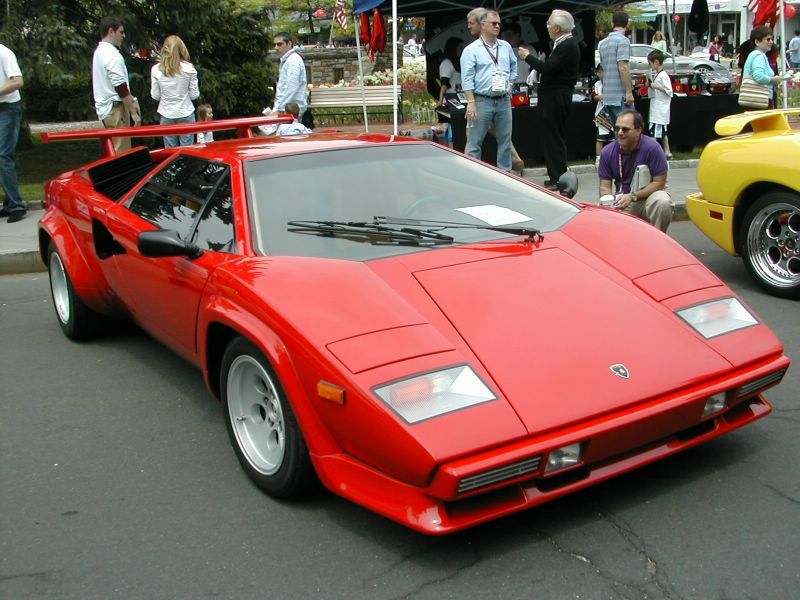 Wolf helped guide the development of the original Countach toward the later, greater one featured here, ushering in the larger engine and enhanced performance (including the rear spoiler), while also helping keep the company solvent. In short, he is credited with having helped save Lamborghini itself, and as a result several Countaches were made featuring Canadian maple leaf logos on them. Taiyo clearly modeled their toy on one such edition of the car. I seem to have talked a lot about how cool this toy looks. But by the latter half of the 1980s, Taiyo were well aware that their toys were only going to be successful if they had the durability and performance to match their appearance. And their breakthrough success with buggies like the Jet Hopper and others that followed, had set a benchmark for tough, go-anywhere toys with simple control systems and “turbo” functions for added fun. And the Lamborghini is no different. Hammer the accelerator into “turbo” on this one, and the car delivers a really entertaining turn of speed. Sure it’s nothing close to the league of the insanely fast brushless-powered stuff you’ll find at your local hobby shop these days. But insane speeds always leave me cold – what’s the point of driving something so fast you can barely see it, let alone control it? With something like this, you still have speed but without sacrificing “scale” looks and behaviour. And you can certainly have a lot of fun with 31km/h – after all, it translates to a “scale speed” of about 372km/h, which is not all that far beyond the 300km/h performance of the real car. With that said, I’d highly recommend that if you do get the chance to drive a Taiyo Lamborghini Countach LP500S one day, that you try it on a smooth surface that allows the wheels to slip a little – simply because this is one incredibly fun vehicle to point and blast in one direction, before sliding and drifting it toward another. About the only downside to this model is the fact that for something so beautiful and so quick (in the realm of retro R/C toys), alas it doesn’t come with a digital proportional control system. Taiyo curiously never (to my knowledge) manufactured a single R/C model that offered a digital proportional radio. I guess they just wanted to keep things as simple and cost-effective as possible on that front. 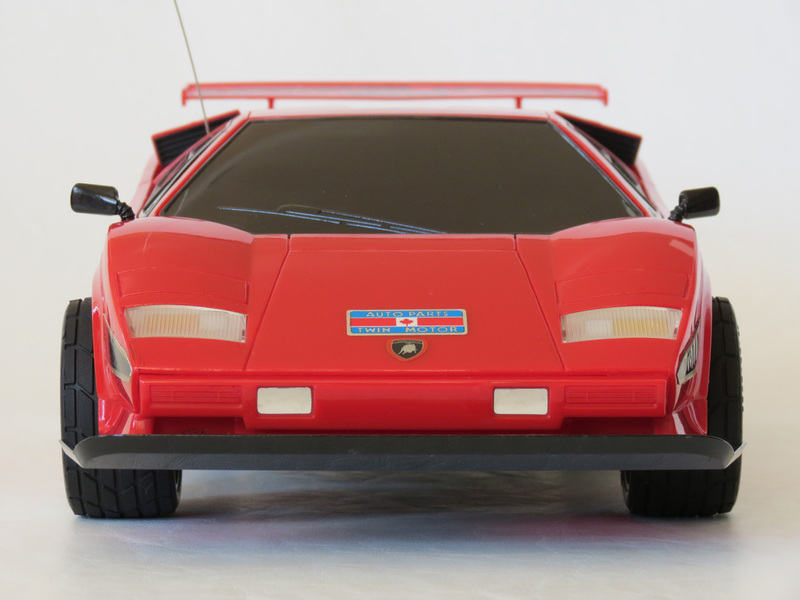 And on the bright side, the turning angle offered by the Countach isn’t excessively oversteered or anything, so the lack of fine-adjustment is not a deal breaker. And the little transmitter is still a very responsive and dependable unit, identical in function to that found on the Jet Hopper. The car came with a nice colour printed owner’s manual, with some spare steering clips taped to the front should you ever bust one of these pieces in a collision – a feat less likely here than on a Jet Hopper due to the front wheels being more protected than on an open-wheeled off-road buggy. Also included in the box is a sheet showing some key spare parts availability – such as tyres, bumper, battery covers etc. In Australia, several of the models in Taiyo’s late 80s period had some spare parts support, the most plentiful of which were the Jet Hopper parts which were stocked in quite a few hobby shops and even other retailers. I can’t honestly say I have ever seen any spare parts around for the Lamborghini Countach, but there must still be a few out there somewhere. 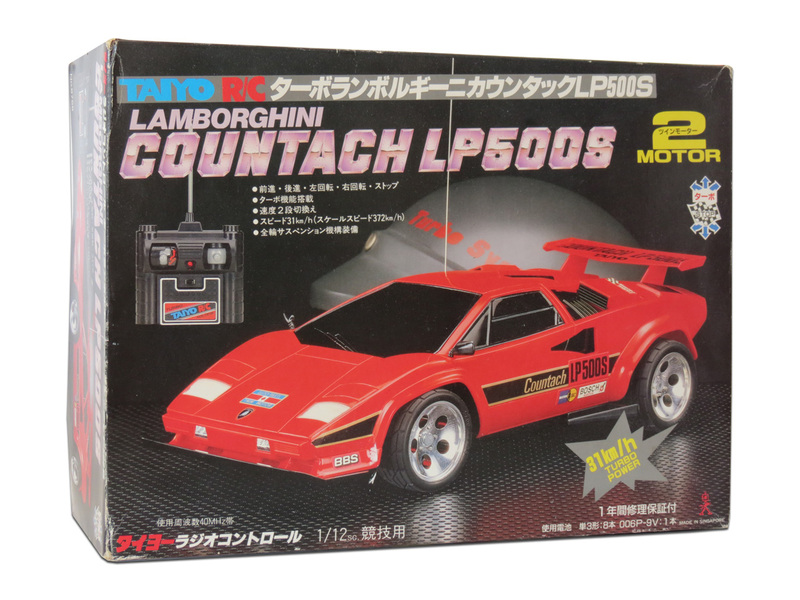 Today the Taiyo Lamborghini Countach LP500S is probably one of the most sought-after models ever made by the Taiyo company, and is highly prized by collectors. As always, new in box examples are near impossible to find, but when they do appear they fetch many hundreds of dollars. Used examples are easier to locate, and the US version released under Tyco/Taiyo branding may be more common still, due to it’s healthy sales in the USA. The black-box original release as featured on this page is considerably more difficult to source in clean condition. Generally speaking, this was also a fairly durable vehicle, and most examples you see around today are still (for the most part) in one piece. However, most will be missing the little rear vision mirrors as these would easily break off. And many will also have tyre wear due to the high-speed, bitumen-only nature of driving this vehicle. Taiyo kept this model in their line-up for several years (until the early 1990s), and it’s easy to see why. It’s definitely a showpiece that still looks as great today, as the year it was released (just like the real car!). Batteries: 8 x AA (Car). 1 x 9volt (Transmitter). Truly a landmark in toy grade rc. I personally consider the Taiyo Twin Turbo chassis (lambo, porsche 962c, ferrari 348, super fight f1) as the best ever toy grade rc as far as performance, design and quality, and I say (toy grade) specifically. I consider most nikko rc’s rc’s from the 80s as entry level hobby grade rather than toy grade, referring to 7.2v battery packs models. Completely agree Bill, thanks for your comment. And yes the line between so-called toy-grade and so-called hobby grade was often never distinct was it, even right back in the early days of electric R/C models in the 70s when Nikko made some predominantly kit-based R/C models, and Kyosho were releasing some basically ready-to-run cars. But as you say, the general quality of a lot of the ready-to-run stuff in the 80s also supports it’s “worthiness” to collectors. Without doubt, many of the cheaper ready-to-run models of today are far, far inferior to the ones that were on offer in the 80s from Taiyo, Shinsei, Matsushiro, Nikko and others. I actually own the smaller Lambo released the same year and its proportions seem very accurate to the real car, unlike the twin turbo Lambo which does not seem like a perfect representation of the real car but as you say “it seems to ooze the power and spirit of the monstrous original” Strange how it works so well? This method was also used for the Taiyo Ferrari f40, which seems to be again off proportion but still has the spirit of the original. The main reason for this would be due to using the same chassis for many models and just changing the body for different cars. The Ferrari f40 shared the same chassis platform with the porsche 911, BMW z1 and Mercedes 500sl. Of course the wheelbase is going to affect the design of the body. I think the porsche and BMW are almost spot on to the real cars. 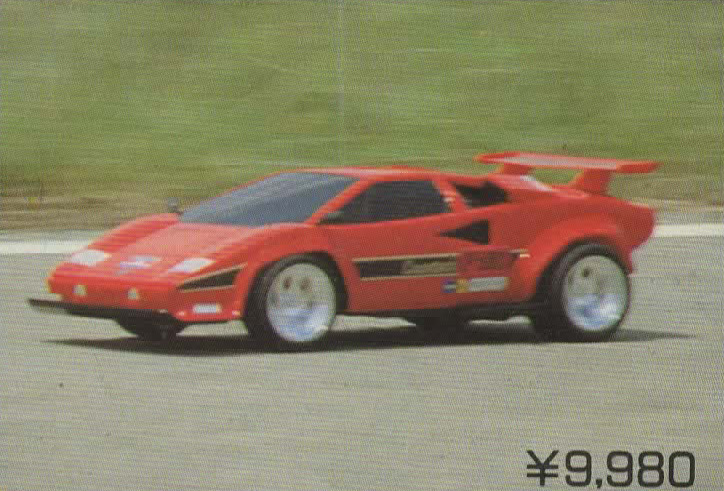 Another point to consider is the Taiyo twin turbo chassis was clearly designed and developed for the Lambo Countach before other models. 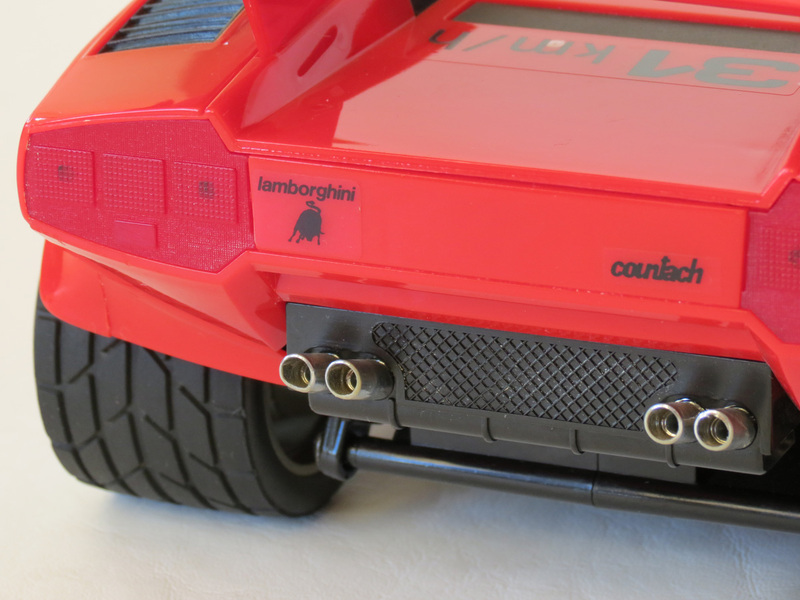 The way to tell is the wheels or rims are styled on the real Countach. The Lambo has chrome rims, whilst the porsche 962c and super fight f1 have the same rims or wheels in white. Perhaps this was just to keep costs down. Only the Ferrari 348 which came out a few years later has its own unique rim design. Está a venda? Qual o valor? Hi Filipe – this Taiyo Lamborghini is not for sale. Sorry. It was a pleasure to read Your article. 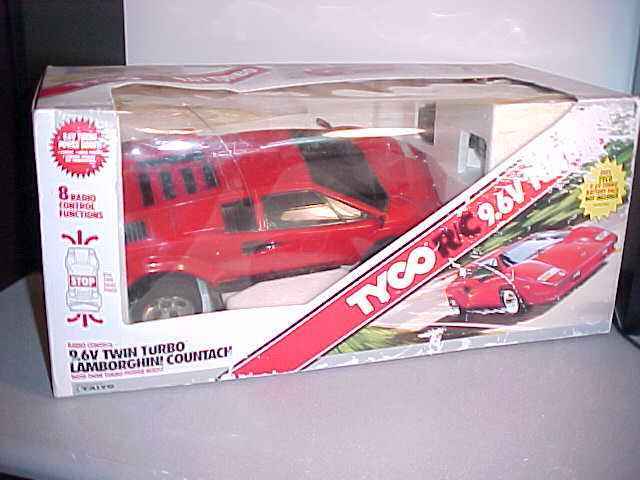 I actually have this countach from tayio. In original box with remote, good condition and working. It is a great fun car, fast and durable. My four years old son is loving it! Sometimes I give it to him for a little ride but it gives me high blood pressure when he near miss things lol. Fortunately, Rob has now (finally) published it 🙂 – I have added it as the Mk2 version of the Lambo now, because the model number of the original is just 8758, and the 8758-27 seems to have been a variant that perhaps was only sold in Europe. Typically all Taiyo models of this era just had a 4 digit model number. Thank you Kenan for the help and info with this. My pleasure! Rob is a great man.